Not only is environmental responsibility important to a community, social responsibility should play a role as well. Construction Resources recognizes this fact and frequently partners with HomeAid Atlanta to give back to the community. Recently, the Atlanta Kitchen arm of Construction Resources provided vanity tops for eight apartment units at Phoenix Pass, another project that was a collaboration with HomeAid Atlanta. 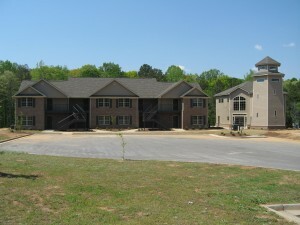 Phoenix Pass is a single-family apartment community in Rockdale County that will provide help for temporarily homeless women and children. The apartments are cozy, with a kitchen, living room, two bedrooms and one bathroom. Residents can stay up to two years, and will receive help with budgeting, job training and guidance in family care and management. This apartment building is EarthCraft certified, meaning it meets stringent environmental and energy standards. Another apartment building is planned, which will also be EarthCraft certified. This transitional housing is the perfect marriage of environmental and social responsibility, and will be a great asset to the Rockdale County area. Construction Resources is proud to be a part of this project. This entry was posted in EarthCraft, Energy Efficient, Green Certifications and tagged atlanta kitchen, construction resources, homeaid atlanta, phoenix pass on May 17, 2010 by Carol Morgan.